The Lind House Board of Directors is pleased to announce that the guest of honor at this year’s Cocktails with the Governor reception will be the Honorable Arne Carlson, Minnesota’s 37th governor. Former Governor Arne Carlson will be joining us for the 10th Annual Cocktails with the Governor reception at the Lind House on Friday, May 30, from 4:30 pm to 7:00 pm. Governor Carlson was our guest in 2007, and we are pleased that he is returning. Previous guests of honor have been former governors Al Quie, Wendell Anderson, and Tim Pawlenty; former senators Rudy Boschwitz and David Durenburger; former congressman Tim Penny, and John Lind’s great-grandson Bill Griffith. Arne Helge Carlson was born and raised in New York City, the son of Swedish-immigrant parents of very modest means. He earned scholarships to prestigious Choate Hall (a private high school in Connecticut) and to Williams College in Massachusetts. He came to the Midwest in the late 1950’s to attend graduate school at the University of Minnesota. Arne was elected to the Minneapolis City Council in 1965 at the age of 31 and served one term. In 1967 he ran as the Republican candidate for mayor of Minneapolis, but lost to Arthur Naftalin. He served in the Minnesota House of Representatives from 1971-1979; and from 1979 to 1991, he was the State Auditor. In November of 1990 Arne Carlson was elected Minnesota’s 37th governor, defeating incumbent Rudy Perpich. During his two terms in office Carlson was a champion of bipartisanship, a friend of public education, and a huge fan of the University of Minnesota. Arne Carlson has remained politically active in retirement. Always a moderate Republican, he endorsed Democratic Presidential candidate Barack Obama in 2008. In 2010, he again broke with his party to endorse Independence Party gubernatorial candidate Tim Horner and DFL candidate Tim Walz for Congress. As a result the State Republican Committee banned Carlson and 17 other Republicans for 2 years from participating in party events. Carlson now describes himself as independent from any political party and is no longer a Republican. In 2011 Carlson teamed with Walter Mondale to propose a nonpartisan budget commission following the July shutdown of the state government. 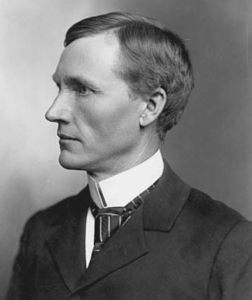 Governor Carlson had three children from a previous marriage, and he and his wife, Susan, have one daughter. Susan Carlson earned a law degree from Hamline University and as Minnesota’s First Lady, her crowning achievement was her work on Fetal Alcohol Syndrome. Advance ticket sales for members available for a limited time. Tickets can be purchased by returning the enclosed form with a check. Tickets can also be purchased at the door, New Ulm Chamber or HyVee. 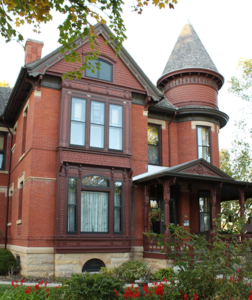 Built for John Lind, an attorney, congressman and Minnesota’s 14th governor, this Queen Anne mansion was constructed of local red brick over a rusticated stone base. It exhibits such quintessential stylistic features as a wraparound porch, imposing turret and bays with leaded-glass transom windows. Beautifully renovated, the house is open for tours, meetings and social gatherings.